I mentioned the strong North wind in the blog yesterday. 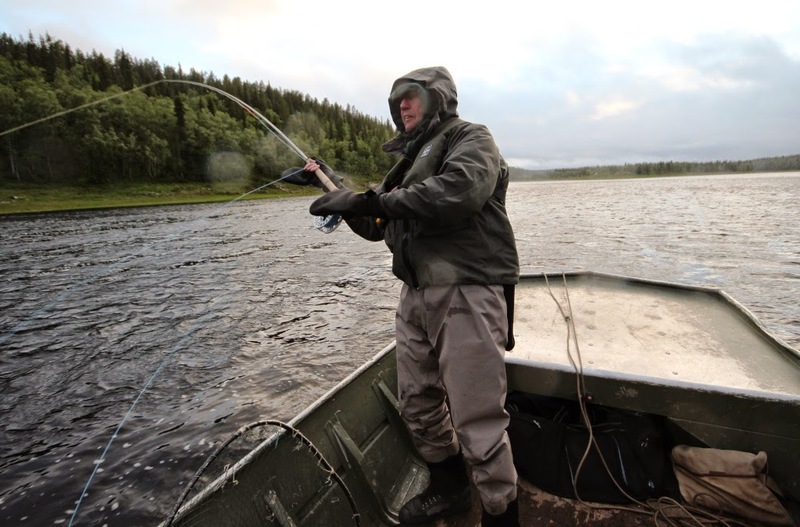 It was a real blow, Steen P has fished here for 17 years and had not seen anything quite as strong before. 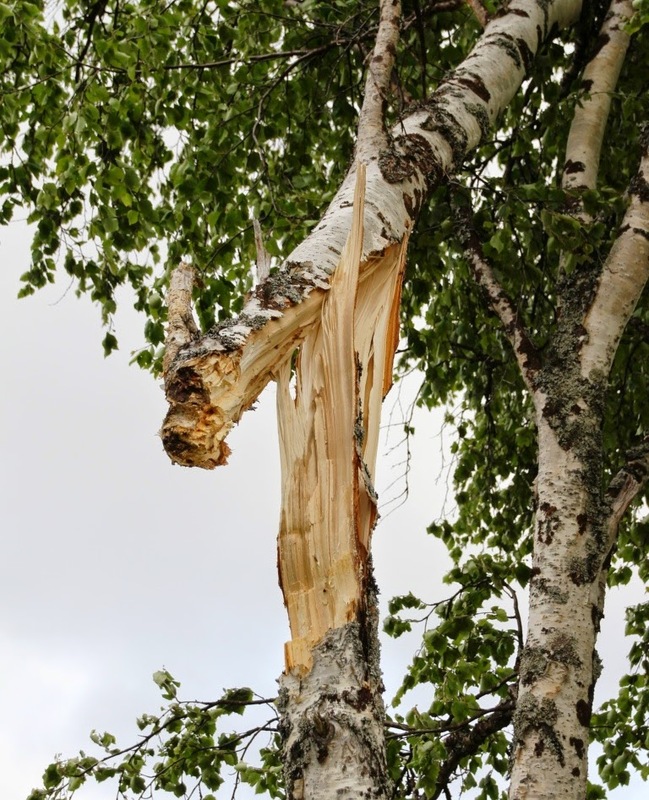 It whipped the door on the laundry room clean from its hinges and broke large silver birch trees on the banks of Generator. It was going to be a challenging day even for the most competent of casters. It was not warm either, so we gave our guests the option of lunch back at camp. I thought that those right at the top, on Scott’s and in Yovas, might vote for that and make the run back down the rapids to hunker down in the Lodge by the fire. But they decided that fishing up there was such a wonderful chance, it was mad to waste the opportunity, even in a gale. Those fishing the closer beats did come in for lunch – late – which surprised me; Donna filled them full of carbs in the form of her ‘cold day’ fare of pizza and stuffed baked potatoes and they were off again in no time. I confess that we had expected a few to have a snooze by the fire in the afternoon and wait for the wind to drop. We underestimated them. Despite the gale, and a water temperature that was down to 9⁰C, Gordon B and David B stuck to their Bombers and had 12 salmon between them. After dinner they asked me if they could try hitched Sunrays in Party, so we took the big boat down to fish the pool, dropping down off the anchor. It was not easy as the wind was so strong casting was really difficult and the gusts threw the boat so much that the anchor kept slipping. We rose three salmon to great surface takes, lost one that seemed to take the Sunray on the way down after coming at it like a Polaris missile, and after 45 minutes returned to the warmth and Michael H’s generously administered whisky. Simon R had another good day with 11 salmon landed and Finn S (known as Finn the Fish) was top again with 14. 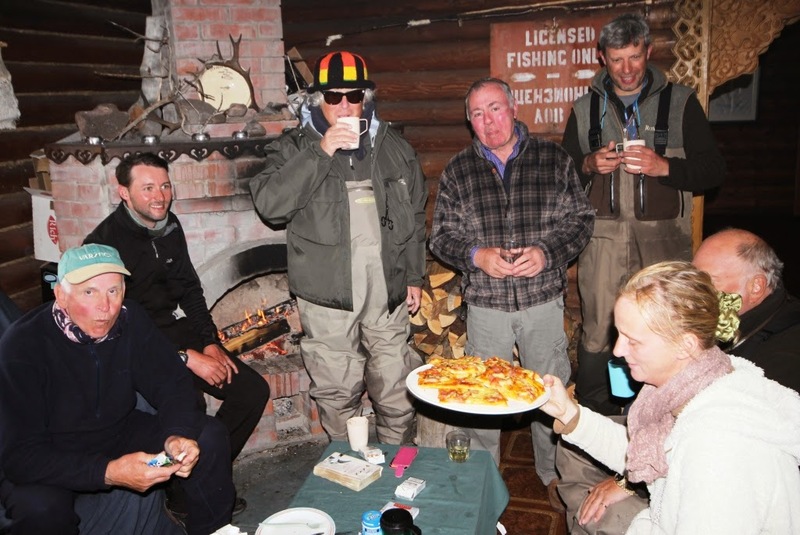 We celebrated the teams remarkable achievement of 74 salmon landed in pretty atrocious conditions. Perseverance did indeed pay off. Slowly the wind is dropping, but it remains strong still and I suspect this gale will not blow itself out until this evening. Our water temperature is down to 8⁰C this morning and the river down 2". Most are back on intermediate tips with the hope that for the last two days of the week they can go back to full floaters.